Boxes available from 3’3 to 10′ x 10′. Can be configured in 2, 3, or 4-sided boxes. When you are able to build your own shield system box, you have a lot more flexibility. Versatility is something that an aluminum build a box easily offers. Since your crew will be assembling the box, you can have it set to the dimensions that you need for the project at hand. In many cases, it only takes a couple of minutes to get the box set up to the size that you need. Should you need to move it, it can often be transported by van or truck, already set up. Not every construction job is exactly the same. An aluminum build a box allows you to adjust your trench box to fit the measurements of the job you are currently working on. Add to that its portability and that it serves the important function of keeping your crew members safe, and you certainly have an invaluable piece of equipment. Make sure your crew has access to quality aluminum build a boxes for their next job. 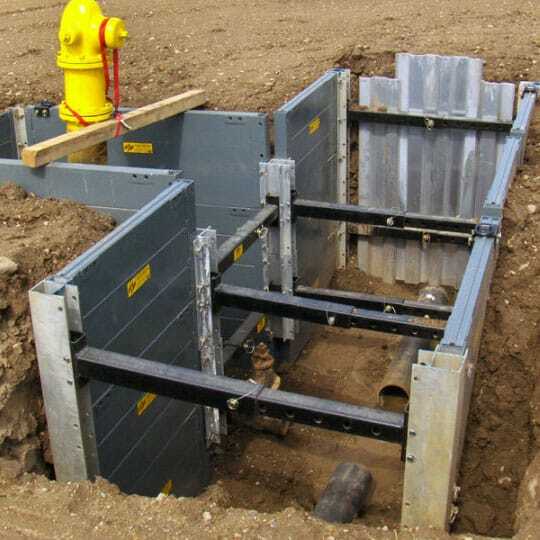 Call us today to learn more about the trench shoring boxes available for sale or rent at Trench Shore Rentals. We used this system four different times on a recent project. Incredibly versatile and easy to set up / take apart. Very good choice to use and happy with the help we got from these guys.